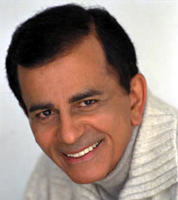 Casey Kasem had one of the most unique and recognizable voices in the English-speaking world. His consummate delivery and inimitable style made him a pop culture icon. At its peak American Top 40 with Casey Kasem was heard on over 450 radio stations in the United States and in thirty countries overseas. In addition to his radio duties Kasem acted in hundreds of motion pictures, TV shows and animated cartoons. And yes, he was the voice of Norville “Shaggy” Rogers in the Scooby Doo cartoons. As a young boy growing up in Detroit, Kemal Kasem’s dream was to be a professional baseball player. An enthusiasm for sports broadcasting led him to Northwestern High School’s radio club. After graduation he became an intern at WDTR, Michigan’s first educational FM station. While majoring in speech education at Wayne University Kasem got his first paying radio job as an usher for Quizdown, a weekly quiz program broadcast over WXYZ. Not exactly a prime radio gig, but at least it got his foot in the door. It wasn’t long before the talented teenager’s voice was heard in front of the microphone. The Adventures of Scoop Ryan, Cub Reporter was produced by Wayne University’s Radio Guild and the Junior League. Airing over WJR, the radio serial featured the exploits of Scoop, played by Kasem, and his grandfather as they traveled the world in search of stories for the town newspaper. An engineer at Quizdown informed Kasem that WXYZ was auditioning actors for the part of Dan Reid, young nephew of The Lone Ranger. He didn’t win the part, but Kasem portrayed other characters on the popular radio show, as well as roles on The Green Hornet and Challenge of the Yukon, better known as Sgt. Preston of the Yukon. In 1952 Kasem was drafted into the army. While in Korea he coordinated and acted in radio dramas on the Armed Forces Network and set up a makeshift radio studio in a Quonset hut, where he honed his disc jockey skills. Upon being discharged in 1954 he returned to his studies at Wayne University and resumed his acting career at WXYZ, while taking on a part-time job at WJLB. The glory days of radio drama, however, were drawing to a close. The last episode of The Green Hornet had aired in 1952 while Kasem was in Korea. The Lone Ranger said "Hi-Yo Silver" for the last time in September of 1954, and Sergeant Preston breathed his last breath of frozen North air in 1955. Radio was changing, and Kasem knew that he had to change with it to survive. In 1956 he acquired a new name and a new job. Casey at the Mike aired evenings on WJBK-AM, where he played the top 40 hits of the day, a new format that was gaining in popularity across the country. The demise of network radio programs caused local stations to scramble for product to put on the air. The new format, with live disc jockeys playing the top 40 hits, was the perfect solution. In addition to his record spinning duties at WJBK Kasem took on another job in the same building, unlike anything he had done before. 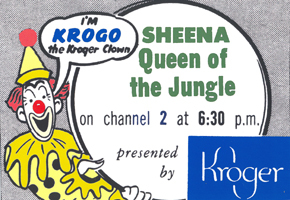 The Kroger grocery chain was looking for an actor to play Krogo the Clown and host episodes of Sheena, Queen of the Jungle, Foreign Legionnaire and Range Rider, three shows that they sponsored on WJBK-TV. Kasem’s radio experience impressed the Kroger executives, so he easily got the job. With his white clown face, pointy hat and squeaky voice, Krogo extolled the virtues of Kroger meats, produce and canned goods while entertaining the kiddies during station breaks. The Kroger program was broadcast live three times a week, from 6:30 to 7:00 p.m. Krogo the Clown waved his final goodbye for the night at precisely 6:56, giving Kasem exactly four minutes to remove the clown makeup and costume, run down the hall and be on the air at 7:00 sharp for Casey at the Mike. Kasem left Detroit’s airwaves in late 1957 for radio stations in Cleveland, Buffalo, Oakland and eventually Los Angeles. It was in Oakland where he developed his unique style of introducing songs with uplifting stories about the lives of music artists. American Top 40 with Casey Kasem made it’s syndicated debut on July 4, 1970. For more than thirty years Kasem counted down the hits, until his last AT-40 broadcast on July 7, 2004. The undisputed “King of the Countdowns” was well known for supporting a great number of philanthropic causes, including anti-smoking campaigns, anti-discrimination projects, anti-alcohol abuse and much more. He was very proud of his Arab heritage and had spoken out against racial intolerance. Beginning in 1981 he co-hosted the Jerry Lewis Labor Day Telethon, both locally and nationally. The Muscular Dystrophy Association chose to recognize Kasem’s contributions by naming him an MDA vice president. Kasem was inducted into the Radio Hall of Fame in 1992, and has a star on the famous Hollywood Walk of Fame. Casey Kasem died on June 15, 2014 after suffering from Lewy body disease, the most common type of progressive dementia. His trademark slogan, “Keep your feet on the ground, and keep reaching for the stars.” was much more than a catchy radio sign-off; for him it was a way of life. He proved that any goal can be reached with hard work, perseverance and a little bit of luck. Casey Kasem reached for his star, captured it, and made the world a little bit better on the way.